I saw only one monarch thus far. She/he looked newly emerged. Butterfly metamorphosis is most fascinating. 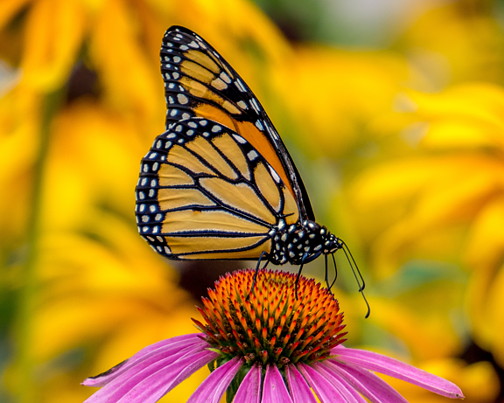 I've only seen one Monarch also, and only one Eastern Tiger Swallowtail- I live in Pennsylvania. Not even many of the little white Cabbage butterflies. Any I do see truly do feel like a Visitation. Beautiful image, thank you. That is exactly the image I am hoping to see this summer... though my echinacea are white instead of the standard ones. I guess I wouldn't mind seeing a Monarch on any of my plants, come to think of it! Beautiful shot.